The unique design of the V-Force reed valve system features double the reed tip surface over a conventional reed valve design. This has two major benefits: 1) The reed petals only travel half the distance as a conventional reed valve design to get the same airflow. 2) Because the reed petals only need to travel half the distance of that on a conventional reed valve design, there is a greater chance of them being fully opened as well as a better chance of sealing when they are "closed". A reed petal never truly "closes" in a classic sense, as it is always in movement. Consider this, an engine operating at 8,000 RPM results in a reed petal opening and closing 133 times in one second. This fact, sheds light on another V-Force advantage. Since the petals are only traveling half the distance, they generally last longer are they receive less wear than the reed petals on a conventional reed valve design. Reed petal resin system, carbon fiber and lay-up. Pre-curved reed petal ensures better seal at tip. Wider reed cage for maximum airflow. Combined reed tip area increased by 10.5% resulting in increased total air flow. Airfoil shape added to cage tip to increase air velocity from outer ports. Long reed stops added to progressively slow petal tip velocity, for increased petal durability. Reduced frontal area of central wing by 15.6% combined with a more aerodynamic shape. I put these reeds on my 2016 KTM 250 XC and its now a different bike.. Throttle response and bottom end got waaayyyyy better!! I was starting to have issues caused by OEM reeds on my '14 KTN 300XC so I got these. As expected product performs very well and delivery was quick. Unbelievable...I was hesitant about installing this on my brand new bike because i thought there wouldn't be much of a difference....i was wrong, oh so wrong. The amount of power i gained is insane. I've gained a lot of low end power, to a point where i needed to tone down my red power valve spring. I've always been a power junkie and always want more, but having the bike lift just from a quarter throttle is not fun in the woods. Very clean low end, smooth transition into the mid but not much top end which is fine. I'm so glad i made this purchase, night and day difference. Stock OEM reed petals busted off after 20 hours on my new bike. Bought these to replace and they fit and bolted right on and didn't even have to make any adjustments to the carb for it to run well. Throttle response good, bog bad! I’ve had great luck with these reeds in the past. I just bought a new to me Husky TC250, with a factory Husqvarna 300 conversion kit! I’ve always wanted a 300 and can’t wait to blow out my first berm on it. However, age and the added knowledge that comes with having ridden used bikes for twenty years mad me do the right thing and tear down the entire bike to really get down to brass tacs with this bike. I’m super glad I did as one of the many things I found wrong with the bike was a worn out, stock reed cage. Every single reed had a gap between the cage. Which explained the bog I was getting. None the less, I was not disappointed after installing the V-force 4 reed cage. Throttle response is crisp and clean! They make a great product! Quality, fit and finish are great. Seems like a slightly larger opening than original cage to allow better flow. Installed on a 2016 ktm 250xcw with stock jetting and pro circuit exhaust. Noticed a slight power gain. Won’t make you push your bike for miles. Didn’t notice any great performance increase, but after reading horror stories of riders being stranded by OEM reeds I knew these wouldn’t let me down. And so far after two years haven’t had a problem riding most weekends. I ride an '07 KTM 250 XC setup for gnarly woods riding. The bike came with a VForce 3 reed block and when I cracked one fo the reeds I upgraded to the VForce 4 on the recommendation of my local KTM shop. Couldn't be happier with it, looking at the picture of the product you'll see the reeds have stoppers/bumpers behind them on this block. That keeps the "flap" within a smaller area and equals faster, crisper throttle response and better bottom end torque. I paired this up with a 13/52 sprocket set and an 11oz flywheel weight and I can pop the front tire over logs, rocks and root faces at will. I do recommend this product. Said it was made in New Hampshire USA. Good to have American made products even tho bike is not! Installed this on a 2016 krm 250 xcw and it definitely made a difference. Crisper throttle response and more nut. All the performance mods seem to provide some return and this one is no different. Install was easy. All you have to do is have ability to remove your carb. Fitment was perfect. Best reed system on the market! Very easy installation! Made the bike come alive on the top end and deffinatly has more grunt on the low end.deffinatly a better choice over the stock reed cage. Added the reeds in an attempt to add a little bottom end power and smooth the power curve a tad. Mission accomplished. The bike is also more responsive. I've changed a couple of item over the winter so wondering if the reeds can take all of the credit. Got the V-Force reeds for my 03 250 sx along with the Lectron carb the bike pulls from down low and is quickly at full noise. Do enduro type riding and find it very easy to control the power. Worked great !!!!! Cleaned up eventhing across the board!!! Awesome product. Install time was minimum and the the bike started first kick cold or warm with this new reed cage. Definitely worth the money! This one item will make your bike run so much better. I and my friend are impressed with the performance gain. I highly recommend it. Very noticeable improvement in throttle response and the fit was spot on. Makes power delivery very crisp and controlled. Would highly recommend! When shopping this was the best value for the money I could find. You will not be disappointed if you buy and use. I ride hard and tear up stuff, so get stuff well-built and you will be happy. RMATV shows that this product doesn't fit older KTMs, which is technically true. However, the VForce website has an asterisk that indicates that it will with a 2004 SX reed cage. I bought the '04 reed cage and VForce and I'm glad I did. It gives a real smooth power response throughout the rpms. I like this product and it was worth retrofitting the SX cage. Does this come with one or both of them? BEST ANSWER: If this is for a Banshee, it will include two Reed Valves. One for each intake. With this upgrade, would I have to rejet the bike? No, my bike was perfectly jetting to begin with and it iust stayed that way. I went from the V-Force 3 cage. 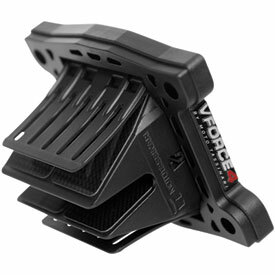 The V-Force 4 cage does make difference across the board. The Vforce4 flows a bit better so it is possible that you could benefit from rejetting after install but strictly speaking it is not absolutely necessary. No jetting needed if you are already properly jetted. You can just enjoy the smoother, stronger low end power. No you won't need to rejet. But I promise you will like what it does for the way your bike will run better. I did not, but would recommend D jetting kit. I did not on my 2014 250sx. BEST ANSWER: I would pull your stock reed cage out and check for gaps. There is a known issue with the 2017s and bad reed cages. I have a 2017 300xc and there were several large gaps in my stock reed cage. This new vforce4R not only solves this issue but the throttle response is very crisp and responsive. It was a easy job to replace to reed valves. The V-Force 4 are built well. The stock KTM reed cage are excellent also. Only replace if the stocks are shot or you wont notice any increase in performance. I had the V-force on my 2014 Husky 300 and it made a huge difference. They also last along time. I never had to do anything with my reeds while I had it. Bolt it in and go! Does this reed cage include a new gasket? BEST ANSWER: I wasn't 100% sure since I have had mine on a couple years so I went and opened the box. Per the instructions it says it has the supplied gaskets. Hope that helps. No,but remove old reed cage gently and reuse the old one. Yes the new reeds came with a gasket . Will this part fit a 2017 TC250? BEST ANSWER: The 2017 TC has a different reed valve than the 2016 and older. This part will not work with the 2017. You would need to order Part# 1767380001 for the 2017 TC250 model. That is manufacture part# V4R26.